How to Grow Mint | Grow This! Mint is a popular herb that makes great tea and is considered to be a useful home remedy for upset stomach and other digestive ailments. You can have your very own crop off and running with these simple steps on how to grow mint at home. 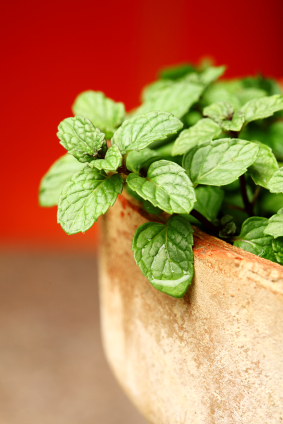 There are over 600 known varieties of mint. Spearmint and peppermint are the most well known varieties but pineapple, banana and chocolate mint are three fun types to consider. Just one mint plant can produce a plentiful harvest for years to come. Mint is a perennial and can be grown year round if weather permits (zones 4-11) or if grown indoors. Set out transplants in the spring after the danger of frost has passed or in the fall in frost-free climates. Mint grows best in partial shade. It will tolerate full sun but will need more frequent water during the hotter parts of the summer and perhaps even some shading from the afternoon sun. Try to find a space where it will receive morning sun and afternoon shade. Mint should be planted in a contained space in the garden because it spreads rapidly and can be very invasive to other plants. Because of the aggressive nature of the plant, containers are a great option for growing mint. Mint plants will do well indoors in a pot as small as 12 inches but may grow too large for an average window seal. When growing mint outdoors, you should opt to grow them in a contained space so they don’t disrupt and even take over your garden. Mint requires loose, fertile soil in order to thrive. Test the soil to be sure you have a pH of 6.0-7.0. Best to add lots of mature compost before planting. This will increase drainage, aeration and ensure your mint get off to a nutritious start. Mint grows best from seedlings purchased from a reputable nursery or from stem cuttings. Mint can be unpredictable and very difficult to propagate from seed. Clip a stem from a healthy mint plant and place it in a glass of water. Once it sprouts roots, you can transplant it to soil as you might a seedling. Set out seedlings only once the danger of frost has passed. Transplant freshly watered seedlings into moist soil and harden them off before leaving them outside. Water frequently until the plants become well established and then you can back off a bit. Keep the soil moist. Container plants will need to be watered a little more often as they tend to dry out fast. Use mulch to help keep the soil warm and moist. Mint will not need feeding if planted in fertile soil. However, occasional feeding of a good organic fertilizer or compost tea should only help keep the flavor consistent. This will be even more helpful when growing mint in small containers. Harvest or prune the tips regularly to keep the plant from spreading too vigorously. Trim away any unruly runners. Harvest mint once the leaves become large enough to eat. Handpick the leaves you like but be sure not to harvest more than 1/3 of the plant’s leaves at once. For larger harvests, the leaves will be most flavorful just before the flowers bloom. Spearmint is recommended for southern grow zones as it assimilates best to heat. Fresh mint purchased at the grocery store can be sprouted and planted, but be sure to find an organic product that hasn’t been treated by anything that may inhibit its growth. Frost will kill any portion of the mint plant above ground. Harvest all mint before hard frosts or bring mint plants indoors. Cover with mulch over winter to preserve until the next growing season. Prune back large mint plants if you’re not harvesting regularly. Overgrown mint produces poor flavored leaves. Because of its pungent smell, mint can help deter pests from other garden plants. Be careful when companion planting mint as it is very invasive. Best to keep it in containers and place amongst your garden vegetables. Replant mint every 3-4 years to keep your plant aromatic and tasteful.